In an age where ""church discipline"" has fallen out of favor in the context of many churches, Eric Bargerhuff calls the church to a deeper understanding of its nature and purpose as an expression of God's ""fatherly love"" towards his people. As a biblically mandated activity instituted by Christ himself in Matthew 18, church discipline is an essential practice of any faithful church that is committed to sharing the Gospel and making disciples. Tackling some of the false notions and assumptions surrounding church discipline, Bargerhuff sets forth a historical, biblical, theological, and practical position that centers its identity and purpose on a proper understanding of the cross of Christ. Since the punitive wrath of God was poured out for sin on the cross of Jesus Christ (a penal substitutionary atonement), it is therefore necessary to reject the notion that church discipline is ""punishment,"" but rather it should be seen as God's hand of forgiveness and grace extended for the purpose of restoring, reconciling, and rescuing one of his own, a ""sheep that has gone astray."" It is to be regarded as God's love in the actions of a forgiven and forgiving community. ""Here is a biblically rooted, theologically formed, and long overdue case for conceiving church discipline as a loving practice of the church. Bargerhuff flies against the prevailing cultural winds that lead most of us, when we hear mention of 'discipline, ' to complete the phrase with the other part of Foucault's title: '. . . and punish.' The evangelical church--and not only the evangelical --desperately needs to recover this neglected church practice as an important means of edification, if not of grace itself."" 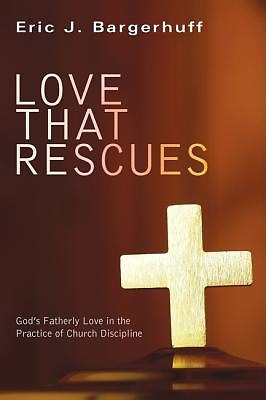 --Kevin J. Vanhoozer Blanchard Professor of Theology Wheaton College Graduate School ""This is a wise, insightful, practical, and theologically rich study of the teaching of the entire Bible about God's loving discipline of his children. It will challenge every church to exercise discipline according to Scripture, lest the church itself fall under God's discipline through unfaithfulness."" --Wayne Grudem Research Professor of Theology and Biblical Studies Phoenix Seminary, Phoenix, Arizona ""Viewing church discipline] as an incarnate expression of God's fatherly discipline, Bargerhuff helps us understand church discipline as a necessary part of being a forgiven and forgiving community. I recommend this book very highly to all who long to see the church flesh out God's dual commitment to ethical and doctrinal purity and to his forgiving, restoring, rescuing love."" --Steven C. Roy Associate Professor of Pastoral Theology Trinity Evangelical Divinity School Eric J. Bargerhuff received his PhD in Biblical and Systematic Theology from Trinity Evangelical Divinity School in Deerfield, Illinois. He has served in pastoral ministry in churches in Ohio, Illinois, and Florida.